Quick: When you hear "Tesla," what's the first thing that comes to mind? We bet it's cars, but the Elon Musk-run firm wants to be known for much more than automobiles, so it's changed its name to help do just that. 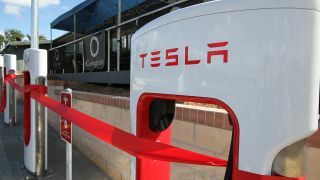 The company formerly known as "Telsa Motors, Inc." is now "Tesla, Inc.", according to a filing with the US Securities and Exchange Commission (SEC). If you were good at those Spot The Difference puzzles as a kid, you'll see "Motors" is no longer part of the handle. Good job. The name change is effective from February 1, so you can stop referring to Tesla as Tesla Motors ... which, granted, you've likely never done before. Tesla dropping Motors from its name signals the company wants - and is - much more than a car maker. Vehicles like the Model S and Model X are its core products, to be sure, and it's the leading proponent of autonomous driving, but Tesla's ambitions reach far beyond the road. In the last few months, Tesla has unveiled solar roof panels (built by SolarCity, which Tesla acquired last year) and a new Powerpack 2 battery for the home. Smart, clean energy is where Tesla's heart lies, and it will only offer more products across the spectrum that power our lives in environmentally friendly ways - new name and all. Tesla's strategic shift is reminiscent of another major firm dropping a certain word from its moniker to reflect a broader scope: You may remember Apple Computer became simply Apple 10 years ago to reflect its broader focus on consumer electronics. "The Mac, iPod Apple TV and iPhone. Only one of those is a computer. So we're changing the name," Steve Jobs said in January 2007. Tesla is following much the same path as Apple here, and though it's product portfolio is small by comparison right now, we only expect it to grow in the months and years to come. Just don't expect a Tesla phone - that seems a little too farfetched.